We’re very happy to announce to recent launch of Banky T-shirts.org, a website that sells t-shirts from the graphic artist Banksy, and donates £1 of each Banksy t-shirt to a charity of your choice! This website uses our in-house e-commerce system to power the online e-commerce shopping experience and the WordPress blogging system to power the Banksy News section. This Banksy t-shirt website is a great example of how our in-house e-commerce system can be heavily customised, added-on to and made bespoke for the needs of the particular system. In this case, the charity choice during the basket and checkout stages is a custom piece of functionality that has been integrated into our system. This is shown on the front-end of the system as part of the customer experience, as well as in the administration to keep record of required charity donations based on each Banksy t-shirt which is sold. 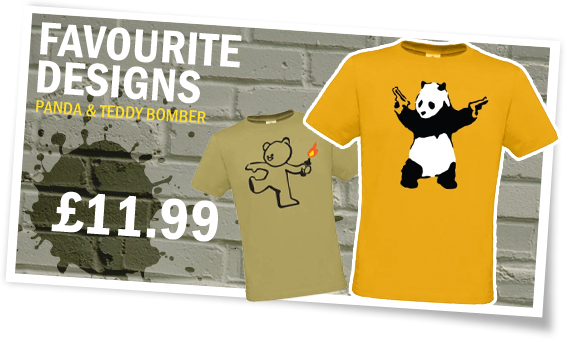 If you want, please go ahead and browse one or more of these awesome Banksy t-shirts!